For a short period of time we are making the pdf version of this book available at no charge. To download your own fully illustrated copy of this story send us a quick e-mail to sue@healinghooves.ca, or request it in the comments section below, and we will send you the link. The paper version of the book is currently being published and will be available shortly. 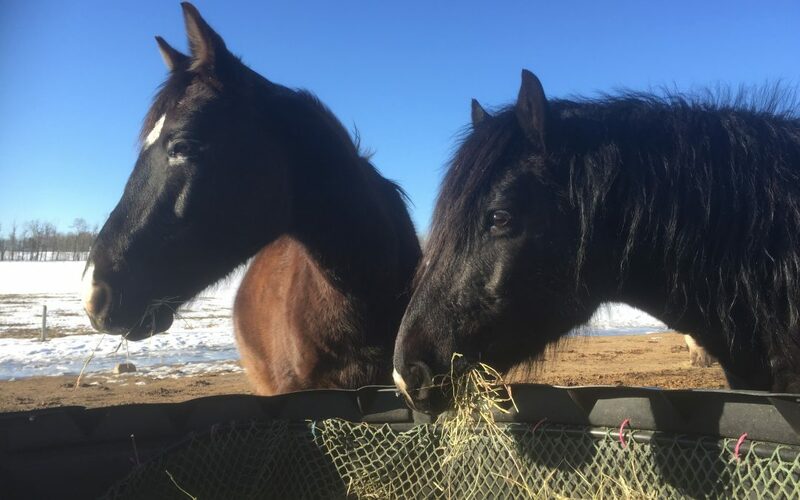 “Why do you always get in such a pickle about everything, Pickle?” Teddy snorted at his own cleverness and trotted across the field, black mane flying behind him like a triumphant banner. Pickle eyed Teddy head off, feeling like the smaller pony even though he was taller than Teddy. Why did he get so upset about everything? Pickle was trembling, his legs quivered uncontrollably, and he was a little out of breath—all because of the scary something he’d thought was hiding in the trees. Not long after venturing out into the pasture for some green grass that morning, he’d seen something moving, heard a rustling, and felt his heart racing. Before he knew it, his quick legs had him running for home. He’d barrelled into Teddy just as Galileo, the farm’s friendly barn cat, emerged from the trees and sauntered off towards the barn. Pickle watched Teddy squeeze into the shelter next to another pony, Thor, and settle in for a snooze. No wonder Teddy made fun of him. Pickle gave one big shake and wandered over to the water trough for a drink. Gulping the refreshing water, he remembered Thor’s words from a few days ago, when Pickle had run away because the farmer drove a tractor into the yard. Water dripped from Pickle’s muzzle. Could he do that? He’d tried not thinking about scary things before but somehow that seemed to make them get bigger, not smaller. Like the day last month when the farm dog had run in the field and snapped at the ponies’ heels. “Stop worrying and start doing something about it,” Teddy had commanded, aiming a kick in the dog’s direction before he found a spot in the fence with just enough space for him to crawl under, leaving the other ponies and dog behind. Pickle couldn’t ignore her, but he also didn’t know what to do. Even after the farmer had called the dog away, he’d run around the field until the sweat ran into his eyes. Pickle shuddered as he found a spot behind the shelter close to Skye, the herd leader. He tried to nap, but images of tractors, dogs, and scary things in the trees kept him awake. Why couldn’t he relax like the other ponies? The next day, after another restless night, Pickle opened his eyes to see white everywhere. 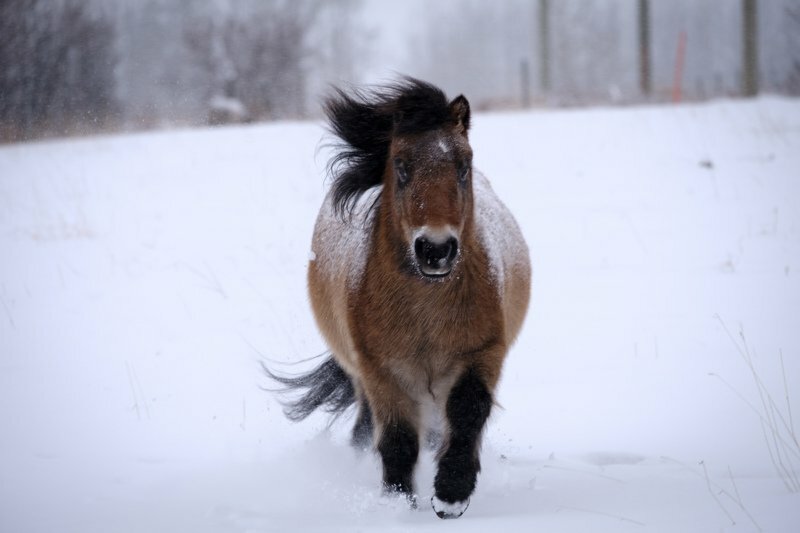 The ground was white, the fence was white, even Skye’s mane seemed to have turned white. Pickle has seen snow plenty of times before. Some days he loved to play in it. He stretched each leg in turn, shaking off a layer of frost. Ugh. He didn’t really like all this cold, but Thor was right. Snow was nothing to fret about. Pickle trotted over towards the water trough after Thor, tossing his mane the way he’d seen Teddy do. Boy, was he thirsty. Pickle blinked. No water? When he arrived at the trough a moment later there was a crowd of ponies staring at it. Pickle watched Thor walk one direction and Teddy run the other, and felt his body start to tremble again. How could he be happy about having hay to eat if there was no water to drink with it? And wasn’t it bad for a pony to eat snow? He paced to the shelter, and back again to inspect the water trough. Still empty. Pickle’s breath came in short bursts and his legs started to wobble. If only he could do something about this problem, like Teddy. Or focus on the good things, like Thor. Why was he standing out in the cold staring at an empty water trough? What was wrong with him? To read the rest of this story – and to see all of the illustrations that go with it – send us an e-mail to sue@healinghooves.ca, or request it in the comments section below, and we will send you the link to download your free copy of the book. Available for a limited period of time! What a great sensitive way to address such silent struggles .. Thank you Monica! I’m glad you liked it! I have shared the rest of the story with you through dropbox so you should be getting an e-mail with instructions on how to access it. If you have any problems with it let me know and I will try again. We have more stories on our blog if you’d like to check them out! Would love the link for the book. Thanks. I have shared the book with you! Thank you for the offer. Would love to download the story. You are very welcome Alexander – I have shared the file with you so you should be getting an e-mail from dropbox. Enjoy! Hi Hope! I have sent you the link (will come as an e-mail from drop box). Enjoy! Thank you so much for the offer, I’d love a copy. I have shared the story with you Natalie! Thanks Susan! I have shared the story with you so you should be getting an e-mail from dropbox with the link. We have a few more available this way too, so let me know if you’d like them and I will share those too! I have shared the story with you!